This batch script acts similar to GQueue for MacGamess, with the exception that you can’t add files after the .bat file has been implemented (run). This new version automatically goes through a directory containing PC-GAMESS input (.inp) files and runs them without having to specify each name in a long batch file. all one has to do is double-click on the rungamess.bat file from a window and it will automatically start the command prompt and program. There is a limit to the use of the FOR command in DOS that I’ve not yet found a way to overcome, so the actual batch script is divided into two files. The first, rungamess.bat, contains the code that collects the .inp files and passes each name sequentially to execute.bat, the file that actually starts PC-GAMESS and runs the calculation. While an annoyance to have two files, once they are placed you never have to touch them again (unless you want to pass parallel calculation parameters to the executable, which are done in the execute.bat file). The image below shows an ideal setup for running these batch files to automate your calculations. 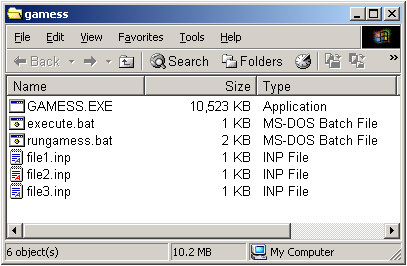 The execute.bat file calls the PC-GAMESS executable as GAMESS.EXE. If you’ve a different name for the program (if you keep track of versions, for instance), go into execute.bat with Wordpad or Notepad and change accordingly. The file names (and batch files) will work universally across windows OS’s provided you stick to the standard 8.3 format. That is, 8 letters for the filename and 3 for the extension. In Windows2000 and higher, long file names work just fine EXCEPT spaces and non-standard characters are prohibited (you’re still running the calculations in DOS mode, remember). With your directory setup, just double-click on rungamess.bat and wait for the jobs to finish. The batch files are provided below in full. You can download each file from the following links (they’re just text files, so you may want to right-click and “Save As.”) The internals are described below each in case changes are needed. When downloaded as the rungamess.txt file, rename this file to rungamess.bat to make it executable. A lot of descriptive stuff about the file, most of which can be ignored. The only thing that may need changing is the deletion of the pause line to remove the break before the calculations go. There for the first time so you can see what’s happening. Note, if you use a different file extension (instead of .inp), then change the batch file accordingly where noted. When downloaded as the execute.txt file, rename this file to execute.bat to make it executable. echo The PC-GAMESS calculation for %1 is currently running. Mostly self-explanatory. The first echo line just keeps track on the screen (in the command prompt) of what calculation is going (where in the file list you are). The GAMESS.EXE line is the formal call for the program as per the readme files that come with it. The only file that NEEDS to be deleted is the input file. The PUNCH file comes out as just a name, while the unix version refers to it as a *.dat file. Useful info inside (depending), so I choose to save it by moving PUNCH to filename.dat. Leave in or remove accordingly. That’s it! Any questions, drop a line. The OpenSuse 10.0 CD set, still the only distro to install cleanly on my Precision M70, DOESN’T contain lots of useful developmental software and libraries some of ye olde quantum chemical codes need to run. This is painfully apparent to those who have downloaded the pre-compiled GAMESS-US code and found it not to do run (and what’s with the OSX in the README?) because of missing libg2c files. Yes, even real tech geeks are too lazy to make some days. That may have come out wrong. 1. Go to rpm.pbone.net or your favorite rpm search engine. 3. Download the libg2c-3.3.6-3.i586.rpm (or machine specific) rpm. Version 3.3.X because the precompiled GAMESS-US code was done with g77 3.3 and why risk any more hassle. I’ve one local i586 copy on this site for when I’m in the middle of nowhere and don’t want to bother with problematic rpm repositories. 4. On the problematic Linux box, login as root (su). With the libg2c file in the current directory, install the rpm. (or whatever flavor you have). 6. Upon completion, GAMESS-US should work just fine in single-processor mode (that is to say, if you’ve got a dual core or dual chip, you should still be having some MPI issues to resolve with Suse).